How exciting to be able to spend a few days in New York City! Three women descended from the sky and hit the ground running. A 6:30 am nonstop flight from New Orleans made it possible to have almost an entire first day to enjoy the sites, sounds and tastes of the big city. Thanks, Delta, for a smooth flight with no delay. Having TSA Pre-check status was wonderful as there was no disrobing or pat downs in the line to board. A real luxury! Dot, Debbie and Donna made a trio of travelers looking for new adventures. All of us had traveled to NYC many times, and this trip we wanted to see and do things that we hadn't experienced before. 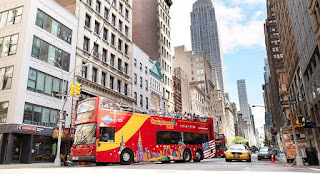 Of course we stayed at a familiar hotel, The Marriott Marquis, because of the convenient location right in Times Square, and we did see Broadway plays and visit THE MET, but the trip was sprinkled with new fun each day. Good planning was the key! First things first: Food. We wanted to go somewhere we had never been so we sought out a recommended pizza joint. Rays Pizza was only four blocks from our hotel, so we walked there and sampled the pizza by the slice and a calzone. The crust was chewy and the toppings were very generous. The calzone proved to be enough food for two people. The restaurant was very crowded, but the service was quick. By the number of pizzas we saw prepared for delivery, we knew it had to be good and it was! After lunch we had time to visit the TKTS booth on Duffy Square and purchase Broadway matinee tickets. We selected "Anastasia." The special appeal for this play was that the lead was played by a young woman from Louisiana whose mother is an acquaintance of mine. Molly Rushing did a great job as young Anastasia. It was thrilling to see a young person achieve a dream of acting and dancing on Broadway. Waiting for the play. A happy place! The story of Anastasia was the ill fated Romanoff princess, who many believe was not executed with the rest of her family in the Russian Revolution. This could have been a sad tale for a musical. Much to our surprise the play was full of hope and love. We were enchanted by the creative sets and the sheer talent of the cast. At least one of us had tears at the end. Such a heartwarming story. Later that afternoon we hit the TKTS booth again and scored tickets to "Waitress." 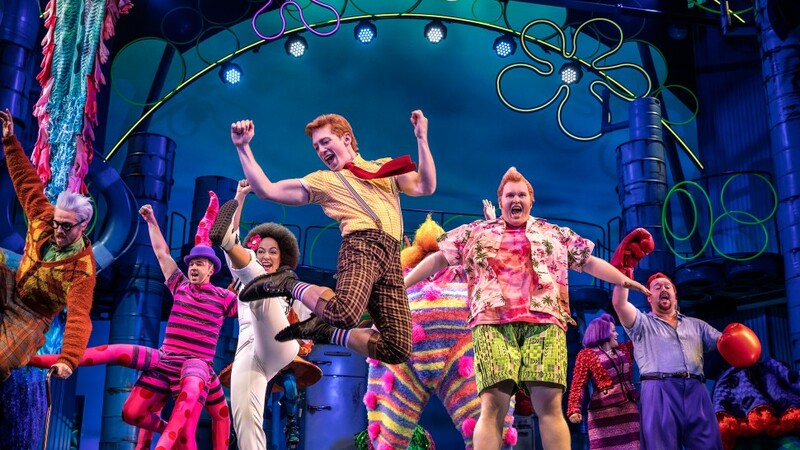 This musical was nominated for four Tony awards in 2016 and was a real crowd pleaser. We cried and we laughed. It is the story of a young woman named Jenna who is in a bad marriage, but is famous for her pie baking at a small town restaurant. She dreams of winning a baking contest, but her dreams are shattered when she becomes pregnant. Her fellow waitresses are her friends and confidants. Their love lives are interesting and in the end all found happiness. The songs were catchy and we found ourselves toe-tapping and laughing at the impossible situations that the waitresses got themselves into! 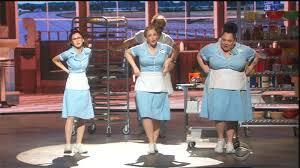 An interesting tidbit about "Waitress" is that real life husband and wife Katie Lowes and Adam Shapiro, play husband and wife in the play as well. I recognized Adam from "Grey's Anatomy." Time for dinner was short and we chose The Mean Fiddler right next to the theatre. The menu that featured a large list of small plates just right for a quick meal. I chose the Buffalo Chicken Spring Rolls and they were very tasty with a glass of Sauvignon Blanc. This Irish Pub right in the middle of Manhattan was big on social media and one could take a selfie and post it on Instagram and they would in turn show it on the big screens all around the place. Fun!! We forgot the picture, so there are a few bites missing! No trip to NYC is complete, in my opinion, without a stop at Junior's Restaurant and Bakery. Junior's is the self proclaimed "Home of the World's Best Cheesecake!" It's a New York City original with 5 locations. It began as a family restaurant in Brooklyn. Large portions and great service characterize Junior's. Dessert was....you guessed it....Carrot Cake Cheesecake. After an exhausting day of fun we bought one slice of this delicacy "to go." We nibbled on it for two days as it was so rich that we couldn't eat it in one sitting. Do not miss Junior's is you go to New York. It's a must! The hotel fees at the Marriott Marquis include one "free" attraction. 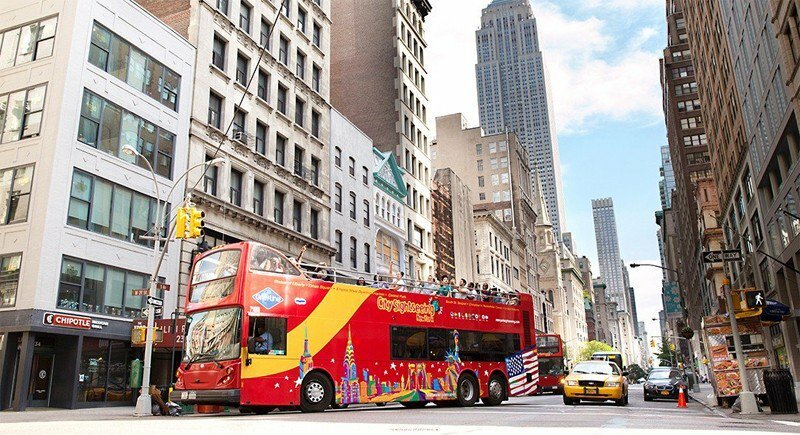 In keeping with our theme of new adventures, we chose to receive tickets to a GrayLine double decker tour bus that featured "hop on, hop off" service. We rode the bus to Soho where we shopped at some places that we don't find back home. Many bargains were to be had. Can you see on the top deck? Each passenger on the GrayLine bus gets earbuds and is treated to a recorded city tour. Our trio thought we knew everything there was to know about NYC, since we had visited so many times. We admitted to learning some new information. One example is that NYC restaurants are graded by the Department of Health. They must display the grade in their windows. We learned that grade A is best and grade D means: "don't do it." Sure enough, we started looking and those letters were displayed every where we went. Another tidbit that I didn't know is that Wall Street was so named because the Colonists had built a wall at that spot to keep the British out during the Revolutionary War. Of course it didn't work, but the street kept it's name. High Energy!! Barrels of laughs!! The selected play for the evening was "SpongeBob SquarePants: The Musical. Our first thought was that it would be silly and just for children. The hawkers at the TKTS book recommended it to us. Since we were in the mood for new adventures, we said "YES!" The play was nominated for 12 Tony Awards and won the Tony for Best Scenic Design of a Musical. The theatre was a grand spectacle and I can see why it won for that. There was also a nomination for Best Musical and I am surprised it didn't win that as well. The humor was not for children, but it helped to know a little about the television show to understand it all. My homework is to learn more about SpongeBob. The amazing sets, the high energy singing and dancing and the subtle humor combined for a superb evening of entertainment! Do see it if you can. You won't be sorry. We capped the evening with a visit to The View, a revolving restaurant/bar on the 48th floor of the Marriott Marquis which happened to be our hotel. The pricey cocktails included a spectacular panorama of the city at night! I enjoyed every drop of my $25 Cosmopolitan....good company and great scenery going by as we turned. Live television is such fun! The next day brought several new adventures. We had tickets for the GMA Summer Concert in Central Park to see Luis Fonsi perform. He is a Puerto Rican singer whose single "Despacito" has had more YouTube views than any song ever. The tickets were free but hard to be procured by online registration through a ticketing website. Early in August when the tickets were available, I was online the minute the issuing began only to be waitlisted! Such a disappointment that was. Three days before our trip I got a text that we had cleared the waitlist and we had our tickets. We had to wake up at 4:30 am to get ready and take a taxi to Central Park. It was still dark outside when we joined about 1000 others to wait in a line for the gates to open at 6 am. Once in the park, we were in for a treat. The situation was orderly and the crowd was polite. People of all ages were there to take part in the music and fun. The concert's sponsor King's Hawaiian treated us to breakfast sandwiches and we each were given bright orange sunglasses! The GMA staffer who warmed up the audience was hilarious and kept up the fun with jokes and audience participation. We got to see the concert twice because we were there for the rehearsal and the sound checks. We were cued as to when we should applaud and dance. It was the best new experience of the trip! "Despacito" is now one of my favorite new songs! As we left the concert we were still humming the melodies and we walked through the park to THE MET. While this was not a totally new experience the exhibit we saw was new to the entire world. 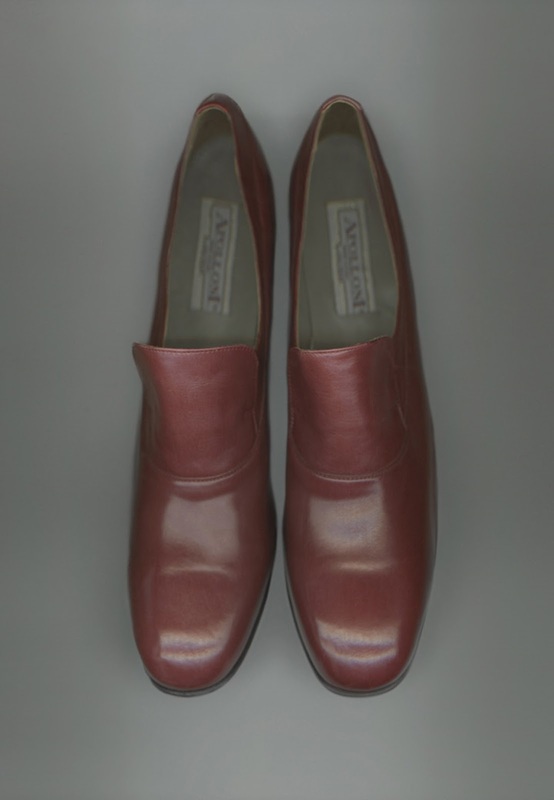 It was Heavenly Bodies: Fashion and the Catholic Imagination. In addition to seeing designer garments that represent a "dialogue between the creators and Medieval art and fashion" there were also papal robes and accessories from the Sistine Chapel that had never been outside the Vatican. We were able to snap photos of the designer garments but not the Papal accessories. The clothing worn by Saint Pope John Paul II was on display. From the clothing it was apparent that he was a very small man. What struck me was the shoes he wore....he had large feet. The shoes were red and matched the embroidery on the robes. He wore them once. We also saw the ceremonial Keys to the Kingdom in an ornate chest. He was presented these on the occasion of his installation as Pope. It was a thrill to see the jewel studded tiaras worn by Popes from times past. The rings and scapulas were also gorgeous. Many of the items were intricately embroidered. Almost every item was a gift to the Pope from a King, order of nuns or a Church of another country. After leaving THE MET we walked 5 blocks down 5th Avenue aka Museum Mile to the Neue Galerie. There we dined in the Cafe Sabarsky on rather authentic German food. Bratwurst and Potatoes and open faced sandwiches on hearty wheat breads were sampled as well as a dessert item of Hazel Walnut Torte. The real draw for this museum, at least for me, was the Portrait of Adele Bloch-Bauer by Gustav Klimt. Adele was Klimt's muse and the painting was done in 1910. Because of the addition of raised gold embellishments on the painting it is also known as "The Woman in Gold." 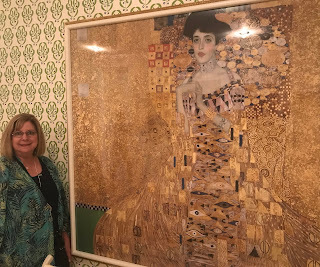 It hung in the Bauer home in Vienna until the Nazis confiscated it right before WWII. After the war, the Belvedere museum in Vienna acquired it and it hung there until the 90's when Adele's niece, who now lives in California, saw it when visiting Vienna. She began proceedings to have it returned to the family. After years of litigation, including a Supreme Court decision, the painting and 4 others belonging to the family were returned to the niece. She sold "The Woman in Gold" to Ronald Lauder in 2005 for $135 million dollars. It now hangs in the Neue Galerie for all to appreciate. Photos were not allowed of the original, but there is a replica where one can take pictures to document a visit. Of course, I had to take a snapshot. Seeing this painting was a "bucket list" item for me as I had read a book and had seen a movie about it and was intrigued by it's beauty and lavishness. The museum also has paintings and accessories by several German and Austrian artists/artisans and is considered to have the "best collection" of those. We saw many Klimts and Schieles. These two were contemporaries and considered by many art enthusiasts to be the first of the modern artists in Europe. The paintings were in many cases stark and almost lewd. Some of the paintings were from the personal collection of Estee' Lauder whose son Ronald founded the museum. The only thing left for the day was another play. We hit the TKTS booth again and decided to see "The Play that Goes Wrong." It's a slapstick comedy of a play within a play. The ramshackle set and the British accented characters including a corpse who doesn't play dead very well, combined for a hilarious show. We laughed until we cried. One character was a master of malapropisms and that added to the fun. It's a "who done it" with twists and turns of "funny." While not a musical, it was very upbeat and recommended. It's a the Lyceum Theatre just off Broadway. The next day was lunch, more shopping and trip to the airport! Again Delta was on time and we enjoyed the ease of the pre-checked status. We left with fond memories of many new adventures and vows to return again. Our trio is very special and we hope to travel together again, soon. St. Luke could easily have been talking about a present day Martha we all know and love. Our own smallish bundle of energy and sweetness is, and has been, the face of St. John the Baptist Catholic Church for over four decades. We admire Martha, and many of us feel like St. Luke’s Mary. We feel guilty because we just can’t keep up. And, the fact that our Martha has a few years on most of us only magnifies our feelings of guilt. Martha and her family moved to Zachary in 1970 and joined St. John the Baptist Catholic Church at that time. That was the beginning of Martha's extraordinary journey of Christian Service. During her presidency of the Altar Society, the treasury of that organization grew from about $1,000 to over $20,000. The projects she directed kept the treasury, used to support various ministries, growing in a positive direction. Her famous fig cakes and jams alone have probably brought in thousands of dollars! Mentoring has been a vital part of her personal ministry. Over the years she had the ability to recognize talent in others and encourage them to give of those talents. Her daily willingness to use her gifts and abilities has strengthened our stewardship. One could never list everything that Martha has done and continues to do for St. John’s. In her retirement, Martha has spent countless hours in service. She can often be seen cleaning the holy water basins, changing burned down candles and other behind the scenes chores that are seldom noticed. She is a “true Martha” as illustrated in Luke’s Gospel. Her steadfast faith and love for Christ shines through in everything she accomplishes in His name. The St. John the Baptist parish community is very thankful for Martha’s dedicated service of over 40 years. She is a "true Martha" as demonstrated by her willingness to serve. She has been a constant who has been a light to all. 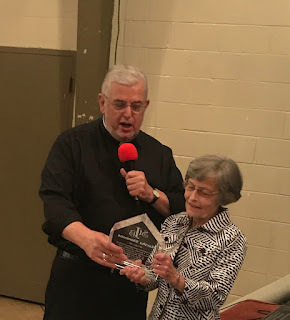 The Parish of St. John the Baptist Catholic Church, Diocese of Baton Rouge, LA presented this award in recognition of her Life of Service to our Church. We Love You, Martha! Your generosity with your time and talents has been an inspiration to everyone you have met along the way.